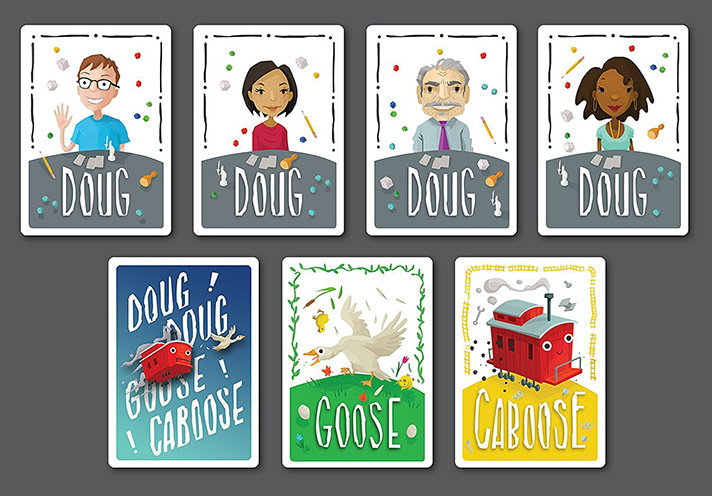 We got a sneak preview at a very inexpensive card game coming to Kickstarter this fall, Doug Doug Goose Caboose by Infectious Play Publishing, that takes this childhood favorite and turns it into a quick card game. And we don’t have to run around a ring of people! The entire game of Doug Doug Goose Caboose is made up of under 20 cards and supports 5-9 players. 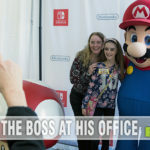 In reality, the more players the merrier as it certainly ramps up the difficulty, especially when played with strangers or distant acquaintances. A game lasts around 10 minutes and is also a great recognition exercise that could be used in a professional setting. That will make sense in a minute – keep reading. 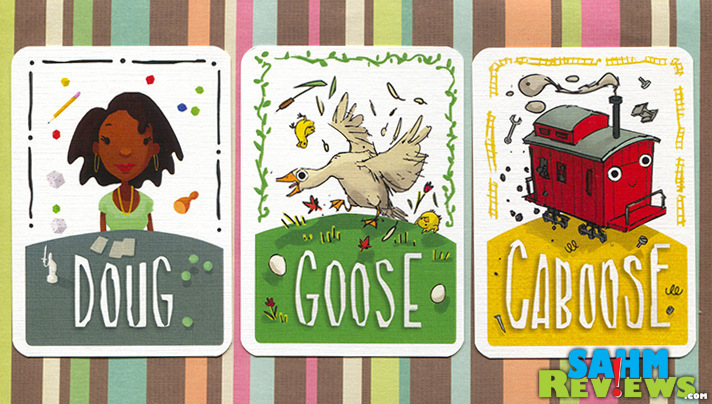 There are three card types available: Doug, Goose and Caboose. There is only one each of the latter two, and you will use as many Doug cards as the number of players minus two. Each player is randomly dealt one card which signifies the character they play for that round (either a Doug, a goose or a caboose). The dealer hands them out face up, calling out the character name each time. Immediate when both the “Goose” and “Caboose” cards are revealed (whichever one is last), those two players race to call out the names of everyone at the table, in clockwise order. The “Dougs” are the judges for the round and require the two active players to start over if they catch a mistake. The “Goose” and “Caboose” must call every player by name and make eye contact. 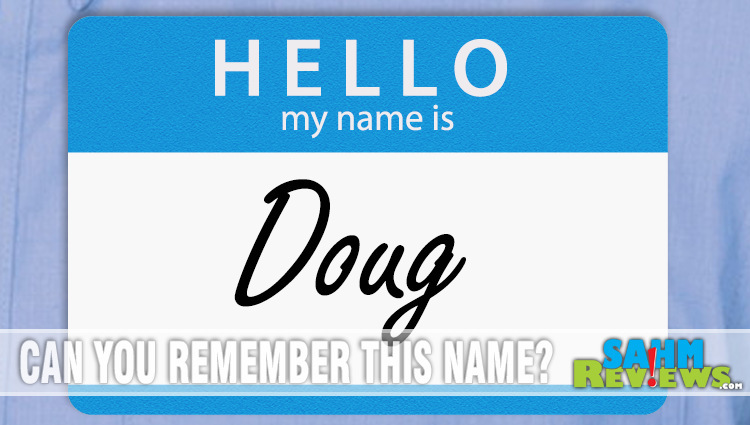 When they get to their opponent, instead of saying their name, they must call them “Doug”. When they get around the table to themselves, they must then call out “Goose” or “Caboose”, whichever one they are. Remember, this happens immediately and concurrently so both players are yelling out names at the same time! The player who correctly finishes naming everyone first is awarded a Score card. If they defeat someone who had previously won a round, they also steal their Score card! The game is played over five rounds (until all five Score cards are awarded) and the person with the most Score cards in their possession wins the game. Here is the spot where I’d tell you where to get your own copy of Doug Doug Goose Caboose, but as I mentioned, this was a preview for an upcoming game. 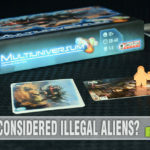 Watch Infectious Play’s website (or Twitter/Facebook feeds) for news on when this game will hit Kickstarter. I hear rumors the entire price may be as low as $10 with shipping included! You certainly won’t find that much fun for this low of a price at a big-box retailer! That looks and sounds so cute! Doug! I can remember that! This is an interesting ice breaker to help everyone get names really stuck in their head. Though if you work at a place like I do names can be tricky to pronounce correctly. Doesn’t sound like it would work near as well with an existing group of friends. 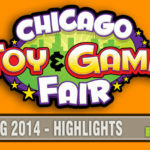 I suppose if you enjoy games and find yourself in relatively small new groups a lot it could be good. It would probably make a decent camp game. It could also be played in schools at the beginning of the year.